I'm not sure exactly when it happened, but spring has hit San Diego. Actually, spring sort of slid in after an extended autumn, and winter? Well... it didn't really happen. And I'm just fine with that. With temps in the 70's nearly year round, identifying the seasons can be a bit challenging. 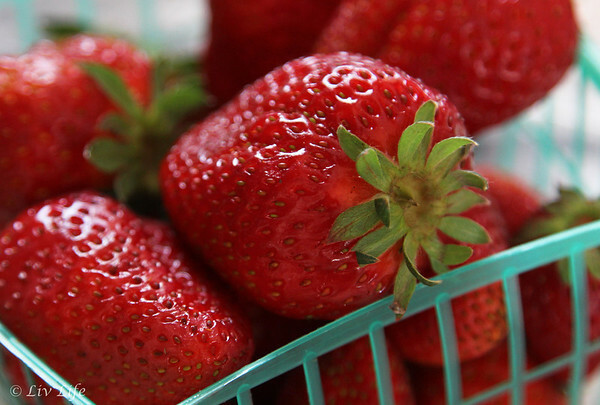 But here in San Diego we know spring has officially hit with a few key hints... the front lawn turns a luscious shade of emerald, my roses are covered with tender new leaves, the plumeria buds are swelling, and the farmer's markets sport tables of brilliant red, juicy strawberries. Home with not just one, but two, three-packs of fragrant berries, strawberries became my obvious choice for this month's Creative Cookie Exchange submission of Berries and Chocolate. Never having actually tasted a strawberry cookie though I found myself a bit stumped. Thank heavens for teenage boys who promptly informed me that strawberries in a plain chocolate chip cookie would fit the bill. And so they did. Adding a delightful sweetness to the soft cookie, strawberries bring a nice depth and an unexpected brightness to the bite of our exchange submission. Want to be part of our monthly Creative Cookie Exchange? Simply contact Laura at thespicedlife AT gmail DOT com and she will get you added to our Facebook group, where we discuss our cookies and share links. You can also use our group as a fabulous resource for cookie recipes--be sure to check out our Facebook page, our Pinterest Board, and our monthly posts. You will find our posts the first Tuesday after the 15th of each month. And now join me as we travel the world for this month's Berries and Chocolate Creative Cookie Exchange! 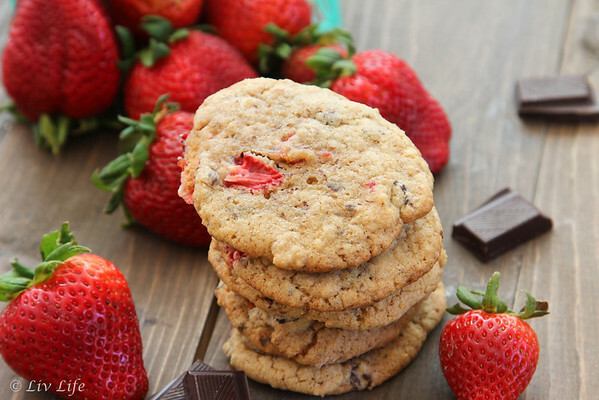 A regular 'ole chocolate chip cookie all dressed up for a springtime event, strawberries bring a lovely and unexpected sweetness to each and every bite. Preheat oven to 350ºF and line two baking sheets with parchment paper or silicone mats. Set aside. In a small bowl whisk together the flour, spelt flour, baking soda and salt. Set aside. Place the softened butter in the bowl of a stand mixer and add the sugars. Mix until combined, 1 to 1 1/2 minutes. Add the eggs one at a time and then the vanilla extract, mixing until combined. Add the dry ingredients to the bowl of the stand mixer and mix until barely combined. Add the chopped chocolate and strawberries mixing again until just incorporated. Place rounded tablespoonfuls of dough onto the prepare cookie sheets and bake until cookies are lightly browned, 12-14 minutes. Allow to cool on the baking sheet for 2-3 minutes then remove to a wire rack to cool. Enjoy! Liv Life Note: While I know eating cookie dough with raw eggs can be dangerous, I must say that I took the risk and tried this dough... might I just say that this was one of the best cookie doughs I've ever had! **Please note that eating dough containing raw eggs poses a risk of Salmonella. 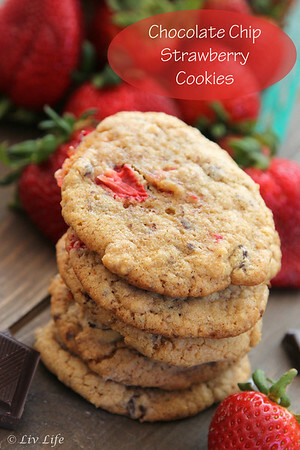 Yum, I've somehow never thought of doing a combo of strawberries and chocolate chips in a cookie. Sounds delicious. They were like chocolate dipped strawberries in a cookie!! You have spring and sunshine and strawberries?? Life is good in California! I can't complain, we are seeing sun and 60s today in Denver. Our snow isn't over yet, though, and we'll need plenty of good cookie recipes to get us through snowy days ahead. I'll keep yours handy for just that occasion. Thanks! Strawberries do bring brightness to just about anything. And when the lovely ruby red gem is combined with chocolate chips, it's a home run every time =) Thank you for sharing your recipe, Kim. I love the combination of chocolate and strawberries, these sound wonderful Kim! Your strawberry pictures are so pretty! I can't wait to pick my first "real" strawberry for 2014! 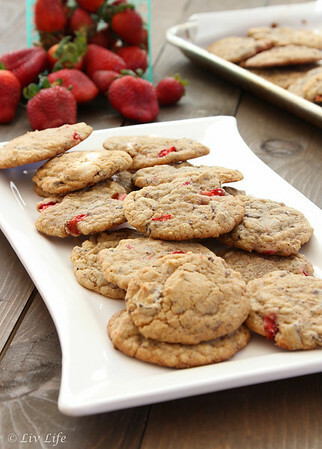 Your cookies sound so good, chocolate and strawberries yum what a great mix. What a perfect combination, is just what you need on a blue day. I love it when the strawberry stands spring up on every corner this time of year! Your cookies look lovely. Oh they sound so good. I've never tried to cook strawberries in cookies, I was worried they'd go soggy. You've alleviated all my fears! Thank you! 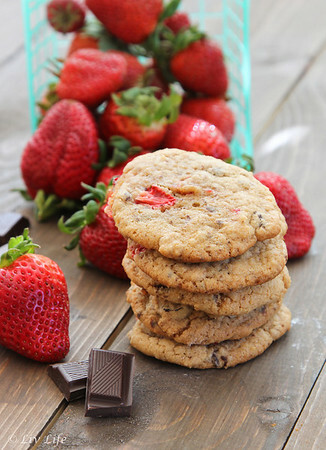 Chocolate, strawberries and cookies, what a splendid combination! They look delicious! If your plumeria buds are swelling, spring is definitely in San Diego air! I'm loving the idea of fresh strawberries in a chocolate chip cookie, Kim. Nice work my friend, may your days continue to be sunny. We seem to get great strawberries here year round so I am looking forward to trying these. They remind me of chocolate dipped strawberries - one of my favorite things to eat - so I am sure I would love these cookies. I am so excited for strawberry season!!! And I will be making these cookies. I happen to love cookies and what a good idea to put them in a cookie! Why have I never thought of doing this!? I love strawberry and chocolate together! Why not put it in a cookie! Just wondering what a cube actually is? 1/4 cup?